Very few of the books published in the United States each year are works in translation. Most estimates put the percentage at about 3 and 5 percent (and even lower if you look just at poetry and fiction). Contrast that with a country like Italy, where as much as 60 percent of publications are translated works. Setting aside arguments about why this is the case, when a work does get published in translation, it’s either a blockbuster in its home country and American publishers are willing to take a risk on a 15- or 30-page sample translation . . . or it’s the darling of an Anglophone editor—often one who reads that second language with some proficiency. Even international bestsellers, though, have a tendency to fade into obscurity, trailed by the pop and whimper of the UPS truck muffler transporting the books back to the warehouse. Each time that happens, it seems US publishers are just a little more reluctant to take that risk again. In its home country of Estonia, The Man Who Spoke Snakish by Andrus Kivirähk (translated by Christopher Moseley), was apparently such a cultural force that it inspired a board game. (You can watch the very charming ad in Estonian on YouTube.) Just imagine an American novel doing that. The comparisons aren’t unjustified. At nearly 450 pages, this fantastical Bildungsroman has the feel of a classic. It’s a yarn in every sense of the word—a bit Tin Drum, a little Where the Wild Things Are, and with a cast of talking snakes, bears, lice, and primates, more than a little Watership Down. 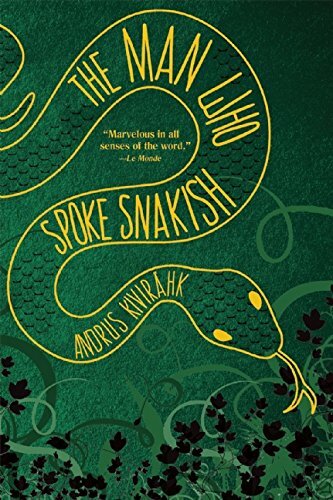 The novel follows a young man named Leemet, one of the last of a sylvan people who can command most animals through the nuanced hisses of a moribund language called Snakish. This story takes place in Medieval Estonia—one populated by knights (“iron men”) and monks—but most tethers to reality end there. This is a world where primates breed and train giant lice, wolves are kept for milk, and bears woo and marry human women. As the novel progresses more and more forest-dwellers flee to a nearby village where they willfully forget Snakish, adopt Christian names, make enemies of snakes, and take to eating something the forest-dwellers find bland, unhealthy, even disgusting: bread. In a motif typical of the book’s quirky—and often violent—sensibility, young village men are becoming monks in droves, eagerly castrating themselves to raise the pitch of their singing voices. In this sense, the novel follows the predictable arc of an endangered culture dying out while its last champions fight for its—and their own—continuity. At its heart, though, The Man Who Spoke Snakish is the story of Leemet, a young man coming of age as the last of his kind. The novel follows him growing up—making friends with an adder named Ints, learning about his heritage from his uncle, coming to terms with a deranged but powerful local sage who demands livestock sacrifices of his family, falling in love, journeying out, making enemies, going to war. Along the way, he stumbles upon his grandfather, a firecracker long-believed dead, marooned on an island where he’s carving chalices from skulls and constructing wings from the bones of all the people he’s killed over the years. Leemet’s grandfather sends him on a quest to capture the winds, the first step in a quixotic journey that will pit the pair—the Estonian equivalents of the grandfather and grandson in Bad Grandpa—against an entire fortress of iron men and bears. It’s in these sections that the novel shines. A sometimes slow-moving, episodic plot gives way here to plenty of blood and guts—action left and right—that may leave readers wondering how they’ve been seduced into rooting for bloodthirsty zealots. In such a world, there is little room for anything but zealotry, on every side, and ultimately, even less room for victors. The age-old battle between progress and tradition rages on. The outcome is in many ways predictable, and in the end, the story doesn’t deliver an allegory that dramatically upends expectations or the themes of so much of similar literature that precedes it. Readers who are charmed by the world Kivirähk creates here, by the imaginative breadth and offbeat characters, will be satisfied just inhabiting this world for 450 pages. Credit is due, too, to the translator and editor, who have made the English feel consistently natural, readable, authentic. Readers holding out for the plot to pick up, an epic quest to begin, however, are better advised to move on. The slow pace, the diligent attention to world-building, the eccentric humor—all make the book a very European work, one that demands Anglophone readers approach it on its own terms—perhaps with a certain amount of humility about the lenses through which they’re viewing it. But once Kivirähk pulls you in, the next question is when will the board game be translated? And: Just how often are board games translated? Johnathan Wilber is a novelist who has most recently received fellowships from the Lambda Writer's Retreat for Emerging LGBT Voices in 2011 and Bread Loaf Writers' Conference in 2014. His writing has appeared in such venues as Hot Metal Bridge, Harrington Gay Men's Literary Quarterly, and the Huffington Post. He has also worked as a junior editor at HarperCollins and Houghton Mifflin Harcourt.